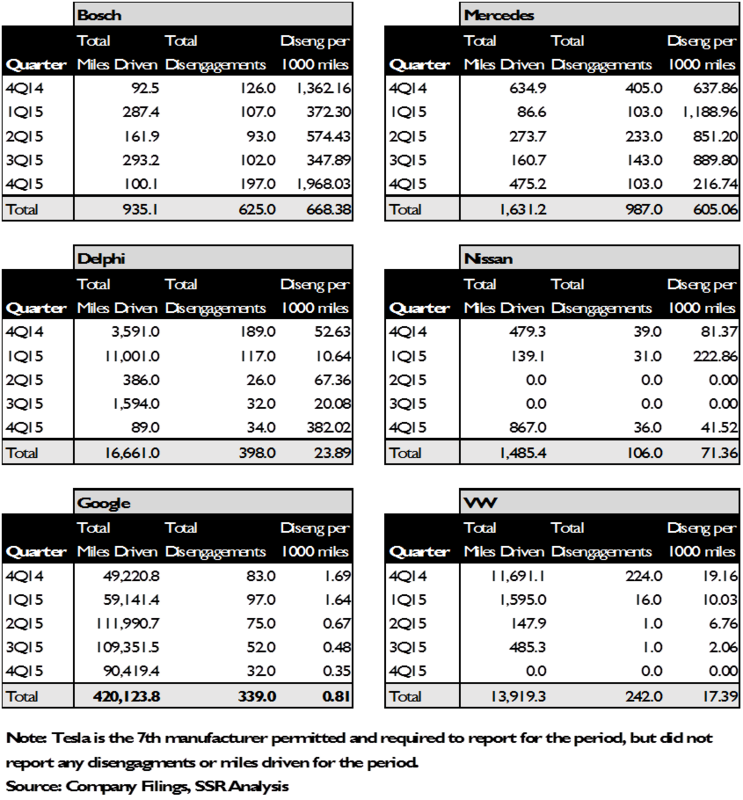 – GOOGL reduced disengagements from 0.8/1000 miles in 2015 to 0.2 in 2016. Only 13 of the 2015 disengagements would have otherwise resulted in vehicle contact, or just 2 incidents per 100,000 miles. – Waymo developed its own fusion sensor suite, tuned to long, mid-range and close distances. 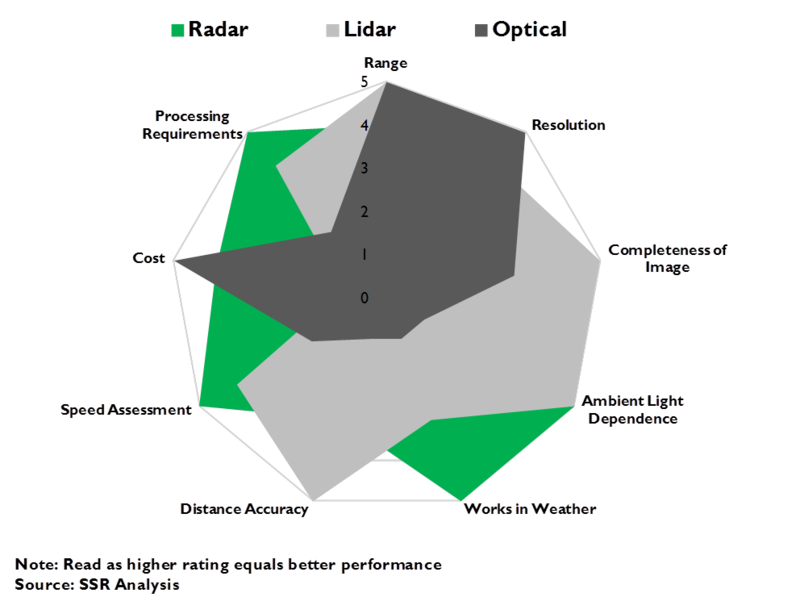 Tight integration with the AI software offers significant performance and cost advantages. The auto industry practically took over CES last week with a barrage of self-driving vehicle presentations and live demos on the streets of Las Vegas. Given that, turnabout was fair play for the Detroit Auto Show, one of the biggest expos for the car trade, to feature John Krafcik, CEO of Waymo – Alphabet’s newly birthed autonomous car subsidiary – for the opening night keynote for AutoMobilii-D, the featured program for vehicle technology. Waymo has been at the autonomous vehicle game for a long time – the Google Self-Driving Car initiative was launched way back in 2008. Since its start, Waymo has logged more than 2.5M autonomous miles, with another 1M driver assisted miles in the database. The test vehicles, first Lexus SUVs with giant racks of sensors on the roof, then more innocuous bubble cars, and most recently, a just delivered fleet of specially fitted Chrysler Pacifica mini-vans, have been a growing presence – not just in and around Alphabet’s Mountain View California campus, but in Texas, and Nevada as well. Still, despite steady reports of miles logged and progress made, other companies have stolen a bit of Alphabet’s self-driving thunder. Tesla launched its Highway Autopilot driver assist system in 2015, Uber hired away Carnegie Mellon University’s DARPA challenge winning autonomous vehicle research program and began running tests with live customers in Pittsburgh. Everyone and their brother was at CES, all of them claiming full autonomy coming soon. Has Waymo lost its lead? We don’t think so. In Detroit, Krafcik pulled back the curtain a bit. California, which was the first state to allow self-driving tests, requires the companies with permits to submit safety reports that identify and categorize the instances where the system was disengaged for driver control. The most recently available reports are from 2015, when Waymo (then Google) logged 420,124 autonomous miles, during which, the driver intervened 341 times – 0.8 disengagements per thousand miles. The next closest rival was VW, which logged 13,919 miles with 242 disengagements – 17.4/thousand (Exhibit 1). On closer inspection, Waymo’s performance is even more impressive. Of the 341 disengagements, 272 were called by the system to resolve anomalies – say a discrepancy between sensors. The thresholds for such disengagements are set very conservatively (Exhibit 2). In the other 69 cases, the human driver decided to take control of the vehicle for any number of possible reasons. 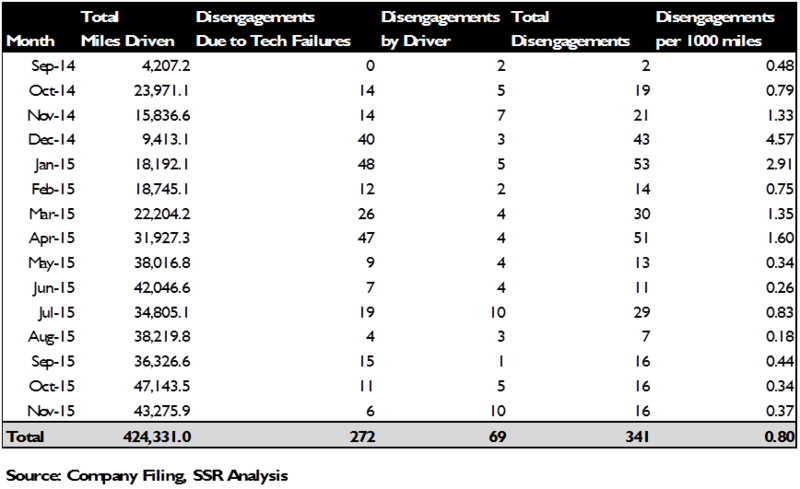 Waymo has analyzed every one of the disengagements, running extensive computer simulations to determine, with reasonable assurance, that just 13 of the disengagements would have resulted in contact with objects or other road users without driver intervention – BTW two of the objects were traffic cones. Of these 13, Waymo believes that 10 are the responsibility of its technology, while the other three were caused by other human drivers. 13 projected accidents (including very minor contact) in 420K miles is impressive, and obviously dramatically better than the other companies testing in California. Of course, Waymo is getting better. Krafcik revealed that his company’s disengagements per thousand miles for 2016 had dropped four-fold to just 0.2, and that he expects it to be even better for 2017, despite pushing the testing into more difficult conditions. The statistics are not necessarily directly comparable – for example, a company that is logging its test miles in uncongested highway conditions will confront far fewer unexpected hazards than one that is driving city streets in rush hour. Still, we believe that Waymo’s testing is turning in dramatically better results under significantly more difficult driving circumstances. Krafcik also dropped that Waymo has begun using sensor suites of its own design, taking the LiDAR, radar and camera parts in house and integrating the hardware solution tightly with the demands of the AI software (Exhibit 3). This offers some significant advantages. First, by tailoring the specs of each part specifically to the data needs reflected by the software development, and developing them in concert, Waymo is much better able to create accurate 3D maps from the fused inputs of the various parts. Waymo has defined its parts to give it a long-range suite, a mid-range suite and a close proximity suite, all of which work closely together without coverage gaps. Second, by developing its own parts, Waymo can get them faster and move down the cost curve more quickly. Finally, with expertise in all parts of its self-driving solution in house, Waymo is in charge of its own destiny, in the same way that Apple has benefited from integration in the iPhone. When considering time to market, this could be an enormous advantage.